Mechs are vehicles that provide the player with protection and adjusted movement, as well as enhanced offensive and defensive abilities. They were present as techs in the beta, and then were re-implemented as vehicles useable in both space and on ground, in update 1.3. Dr. Akaggy will introduce the player to Mechs, and unlock their first, racial-themed vehicle after they complete the quest Test Drive. Also in the Mech Workshop are two important mech stations - the Mech Assembly Station and Mech Part Crafting Table. Body: Affects Maximum Energy of the mech and its Defense. Also determines the resistance of the mech to planetary hazards (Deadly Radiation, Deadly Chill, and Deadly Heat). Boosters: Affects Flight Speed and Maneuverability. Left and Right Arms: Are weapons, with different effects and energy usage. Legs: Affects Ground Speed and Jump Power. Horn: In space, nobody can hear you honk. Different parts can be obtained by learning their corresponding blueprints, usually found in non-planet locations in space. They can be equipped to the mech by using the Mech Assembly Station on your space station, or in Dr. Akaggy's workshop. The player automatically acquires a mech by completing the Test Drive quest. Once completed, they can deploy their mech while they are on their Ship using the "Deploy Mech" option on the teleporter - this option only appears if the ship is parked at a space encounter, an asteroid field, or orbiting a visitable planet. Clicking this button launches a drop pod containing the player inside their mech which breaks apart upon arrival on a planet or entrance into a space encounter. On planets and in sections of space encounters with gravity, the mech's movement is similar to that of the player. Left and Right inputs move the mech left and right, Jump input causes the mech to boost upward, and Down + Jump causes the mech to drop through platforms. In sections of space encounters without gravity, the mech uses a different movement scheme. The directional inputs accelerate the mech in their respective directions, and the Jump input brings the mech to a stop. In all cases, Left Mouse Button activates the mech's left arm, Right Mouse Button activates the mech's right arm, and F activates the mech's horn if one is equipped. Also, the Interact input causes the player to exit and enter the mech. The player's mech automatically despawns when the player beams off of a planet or out of a space encounter, becoming available to deploy again from the player's ship. The mech assembly station window. After interacting with the Assembly Station players will see slots, similar to their armor equipment slots. These slots can be fitted with corresponding mech components. As pieces are slotted in, the total energy and energy usage rate as well as the mech appearance will adjust. There are two color pickers underneath the Assembly diagram -one for the main color of the mech, and one for accent color. These options, if set to a color other than the default, will recolor all mech parts together, making the entire mech color coordinated with the selected options, and any swapped-in mech pieces will automatically color-adjust to the selected color palette. Mechs have their own energy reserve, visualised as the blue bar above the vehicle. 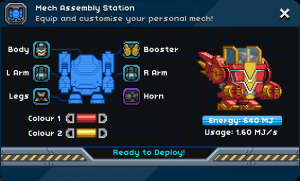 Using the mech will deplete it at a specified rate, which can be found on the Mech Assembly Station interface. Receiving damage also depletes energy, and attempting to pilot a mech on a planet without a body with resistances to its planetary hazards greatly accelerates energy drain. (Weapons are already accounted for by the energy drains added by their arms, so weapon usage does not deplete energy.) Hostile space entities, when killed, drop energy batteries that the mech can absorb to restore its own energy; no such energy regeneration mechanism exists on planets. If the mech was brought to 0 energy by a source of damage or by Lava-accelerated passive energy drain, the mech explodes for massive fire-type damage (which is not survivable except in some niche scenarios involving general and fire-type damage reductions). Otherwise, if the mech's energy reaches 0 due to passive energy drain (even if accelerated by a harsh planetary environment), the mech simply vanishes without exploding. Mech part schematics are unlocked by consuming mech blueprints, found in space encounters. The player will receive their first mech components, enough for a basic starter mech, after completing the quest Test Drive. The tooltips for each mech piece display their stat levels. 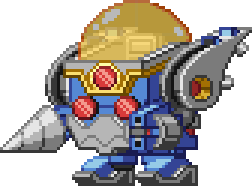 Each player receives an initial mech body which is racially themed to their character's race. Each race has an available upgraded racial body which they'll learn to craft after completing the quest Advanced Test Drive. All mech components are crafted at the Mech Part Crafting Table which can be found beneath the Outpost. The station next to the crafting table, the Mech Assembly Station, is used to equip pieces. There's no penalty to switching parts using a Mech Assembly Station, but each player can only have one mech configuration at once. Deadly Radiation: Resisted by Durasteel-tier bodies (upgraded racial bodies) and better. Bodies which do not resist this effect drain 20 more MJ of energy per second on natural Tier 4 Planets. Deadly Chill: Resisted by Violium-tier bodies and better. Bodies which do not resist this effect drain 25 more MJ of energy per second on natural tier 5 planets. Deadly Heat: Resisted by Solarium-tier bodies. Bodies which do not resist this effect drain 30 more MJ of energy per second on natural tier 6 planets. Mechs will still shield their pilots from status effects and most damage sources even if they themselves cannot resist the environment. Mechs, however, cannot shield their pilots from taking damage from the Erchius Ghost on natural Moons, and they drain 40 more MJ of energy per second while in contact with Lava (if energy reaches 0 while in contact with lava, the mech will explode). Each part of a mech, apart from the horn, determines certain performance characteristics of the mech. Max Energy: Begins at 400 MJ, increases by 80 MJ for each filled segment of Max Energy. Damage Reduction: For 1/2/3/4/5 filled segments of Defense, incoming damage is reduced by 76/80.8/84.6/87.7/90.2% before being deducted from the mech's energy (the numbers shown when damage is taken do not include this reduction). Air Control Speed: Maximum horizontal speed in the air in environments with gravity. Starts at 2 tiles per second and increases by 1 tile per second for each filled segment of Flight Speed. Air Control Force: Determines how quickly the mech changes horizontal speed in mid-air in environments with gravity. Starts at 10 and increases by 5 for each filled segment of Maneuverability. Flight Control Speed: Maximum speed in zero-gravity environments. Starts at 5 tiles per second and increases by 5 tiles per second for each filled segment of Flight Speed. Flight Control Force: Determines how quickly the mech changes speed in zero-gravity environments. Starts at 40 and increases by 10 for each filled segment of Maneuverability. Ground Speed: Maximum horizontal speed on the ground. Starts at 3.25 tiles per second and increases by 1.25 tiles per second for each filled segment of Ground Speed. Jump Velocity: Upward speed during the boost phase of a jump. Starts at 14 tiles per second and increases by 4 tiles per second for each filled segment of Jump Power. Jump Boost Time: Length of a jump's boost phase. Starts at 0.45 seconds and increases by 0.05 seconds for each filled segment of Jump Power. Energy Drain: Starts at 0.1 MJ/s, increases by 0.05 MJ/s for each filled segment of Power. This drain only occurs while being fired, there may be a bug that only drains one arms worth of energy if they are both firing at the same time, more testing is required to confirm this. Estimated Damage Output: Starts at 100 DPS, increases by 50 DPS for each filled segment of Power (see each mech arm's page for actual DPS). Venturer-00 Mech Body A prototype open-top mech body, designed by the Letheia Corporation. Arthuria-00 Mech Body A prototype open-top mech body, designed for Glitch pilots. Champion-00 Mech Body A prototype open-top mech body, designed for Avian pilots. Dominion-00 Mech Body A prototype open-top mech body, designed for Apex pilots. Golem-00 Mech Body A prototype open-top mech body, designed for Floran pilots. Kabuto-00 Mech Body A prototype open-top mech body, designed for Hylotl pilots. Marshal-00 Mech Body A prototype open-front mech body, designed for Novakid pilots. USCM Mech Body A mech body manufactured by the now-disbanded USCM organisation. Occasus Mech Body A crudely engineered mech body, designed by members of the Occasus cult. Skulduggery Mech Body A mech body used primarily by pirates and mercenaries, for obvious reasons. Shockhopper Mech Body The Shockhopper MK II, a body designed to fit with modular mech components. Reactor Mech Body An experimental mech body powered by an unstable radioactive core. Golem Mech Body A mech body fit for a Floran, made from vines and recycled mech parts. Venturer Mech Body A sturdy mech body, originally designed by the Letheia corporation. Kabuto Mech Body A sleek Hylotl-styled mech body, complete with a trinocular scouting system. Arthuria Mech Body A mighty Glitch-styled mech body, made from thick layers of plated violium. Marshal Mech Body A unique Novakid-styled mech body, built for tireless and skilled pilots. Champion Mech Body An imposing mech body, designed in the image of an Avian warrior. Dominion Mech Body A high tech Apex-styled mech body, powered by a vented cold fusion reactor. Exodus Mech Body A powerful mech body operated by a web of synthetic brain tissue. Occasus-2 Mech Body A high-tech mech body, designed for high ranking members of the Occasus cult. Hero Mech Body Defend the universe with this exciting looking mech chassis. Lilotron Mech Body A mech body based on the Lilodon. Its bark isn't quite worse than its bite. Protector's Mech Body A finely engineered mech body, for use by members of the Terrene Protectorate. Cyclops Mech Body A mech body that uses a cutting-edge energy field to protect the cockpit. Nightwinder Mech Body A mech body made for stealth and infiltration, personalised with a spooky skull face. Basic Mech Boosters Mass-produced mech boosters, with external fuel tank attachments. Astro Mech Boosters A set of mid-range boosters that use a series of long thrusters. Stalwart Mech Boosters A classic design of mid-range boosters, historically used by delivery crafts. Zed Mech Boosters Speedy mid-range mech boosters that are shaped like the letter Z.
Sleek Mech Boosters Very sleek mech boosters. Hammer Mech Boosters A set of large boosters, which trade speed for greater control. Zero Mech Boosters A set of pointed, high quality mech boosters. Be careful with those corners. Gallant Mech Boosters A set of slick mech boosters built with intricate circuitry for high performance. Basic Mech Legs Mass-produced mech legs that allow for basic mobility. Hopper Mech Legs A mid-quality set of mech legs designed for jumping. Twinjet Mech Legs Mech legs that have an extra jet booster for balanced performance. Arc Mech Legs Claw-like mech legs, designed to be streamlined for speed. Sleek Mech Legs Sleek mech legs that pair composite socks with titanium sandals. Ronin Mech Legs A high quality set of mech legs designed for maximum jump height. Intrepid Mech Legs Heavy duty mech legs that balance speed and thruster power. Hermes Mech Legs Finely crafted mech legs that provide the fastest possible ground movement. Airhorn Mech Horn Make a little noise from the comfort of your own mech. Bike Bell Mech Horn Assert yourself with a gentle ring. Bull Mech Horn Why simply grab the bull by the horns, when you can BE the bull? Charge Mech Horn A musical fanfare, typically a prelude to a sporting event or gruesome battle. Foghorn Mech Horn A horn traditionally used to warn others of nearby hazards. Melody Mech Horn La cucaracha, la cucaracha, ya no puede caminar! Robot Voice Mech Horn Give your mech a booming voice to intimidate your foes. Rubber Duck Mech Horn A timeless classic. Sports Mech Horn Shrill and loud, this horn is perfect for obnoxiously announcing your presence. Toy Mech Horn This horn module is surprisingly small... I wonder what it sounds like? Train Whistle Mech Horn Put on your conductor's hat and get on track for fun! Truck Mech Horn For beeping angrily when someone won't move out of the way. This page was last modified on 19 March 2019, at 15:14.